Seniors Emily Pfeiffer and Natalie Armel are representing University of Lynchburg as George C. Marshall Undergraduate Scholars. As members of the Marshall Scholarship program, the students will do research using primary materials from 20th-century diplomatic/military history and political affairs and will write papers based on their findings. 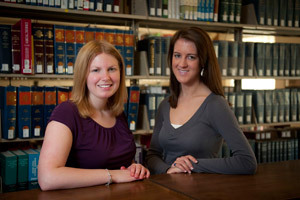 The Marshall Scholarship program, which includes undergraduates at select Virginia and Mid-Atlantic colleges, is sponsored by the George C. Marshall Research Library in Lexington, Va. Students have access to both the resources and collections of the Marshall Research Library and materials from other archival repositories at colleges, universities and other institutions. Assistant Professor of History Brian Crim noted, “LC is sending some of our best and brightest to the George C. Marshall Undergraduate Scholarship Program. The History Department is proud of our majors for producing original research projects using the holdings of the Marshall Library in Lexington. Each year, the directors of the program comment on the professionalism and talent displayed by LC students.” The Marshall Scholarship includes a $250 cash award. The paper judged most outstanding will receive the Larry I. Bland Scholars Prize and an additional $500 prize. LC had two students participate in the Marshall Undergraduate Scholarship Program last year: Samantha Bryant ’11 and Christopher Edwards ’11. Joanne Hartog, director of Research and Scholarly Programs for the George C. Marshall Foundation, recently announced that Samantha’s paper placed sixth out of some 25 papers submitted from participating institutions including the University of Virginia, Georgetown, Virginia Tech and Washington and Lee. Chris’s paper, “Circumstances of Victory: Policies and Politics of Displaced Persons in Post World War II Germany” was a finalist for the Larry I. Bland Scholar’s Prize. Both Samantha and Christopher are currently enrolled in graduate history programs, Samantha at James Madison University and Christopher at University of Lynchburg.